Oh Jones...: America's Bachelor, My New Bff? America's Bachelor, My New Bff? Last week I posted my recap on twitter. 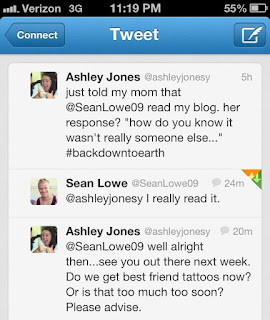 My best friend Sara, who by the way is hilarious, and you should follow her on twitter (sir108), tweeted my blog link to Sean Lowe. I've tweeted to famous people before and never really gotten a response. Chobani and Cinnabon replied once...so I was thinking that was as good as it was going to get. I had made peace with it. I immediately called Barb Jones, to which she replied, "well how do you really know it was him and not just someone pretending?" I then yelled that his account was verified and hung up. Then I really started doubting myself because one time I wrote Jonathan Taylor Thomas a fan letter every week and when I got an autographed picture back my friends at school told me it was a stock picture that everyone got. I haven't gotten confirmation if we are in fact making an appointment for our Chris Harrison holding a tray of roses tattoos yet. However, I'm sure he'll get back to me soon enough. Now that Sean and I are clearly best friends (right? that's how it works?) I was super pumped for this week's episode. The first one on one date was with Sarah. You'll remember her as the girl who has one arm. You won't be able to forget that she has one arm because she mentions it every 2 to 3 seconds. 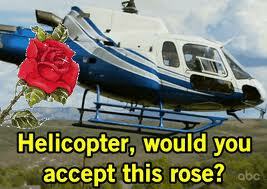 He picked her up in the very eco-friendly "Bachelor" preferred mode of transportation, the helicopter. I swear y'all, they have more helicopter transports in this show than on "Grey's Anatomy." Sean takes Sarah to the top of a building that they are going to free fall off of which Sarah clearly believes. 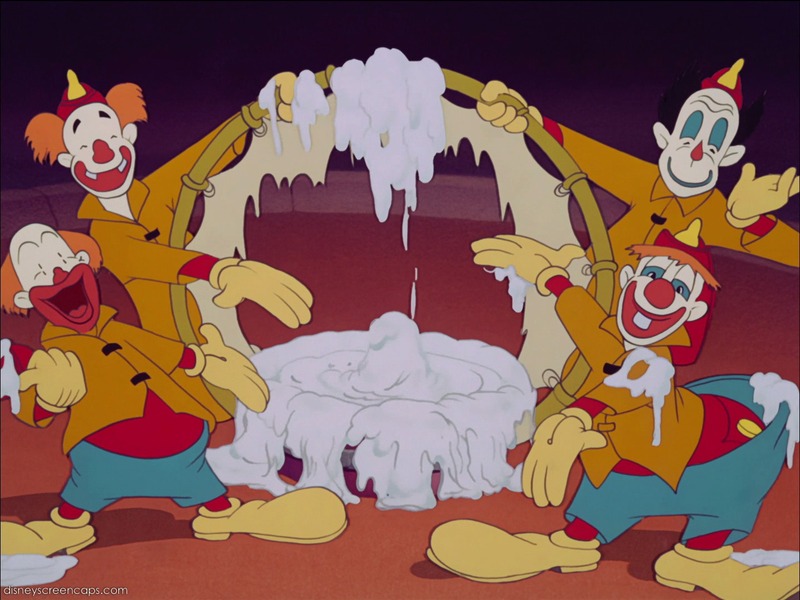 I believe she really thought that they were just going to jump and Chris Harrison was going to catch them with a big net a la the circus clowns in "Dumbo"
They actually just drop in one of those window washer cages which seems really cool. Had they strapped some sponges to them, it would have been a productive date as well. Window cleaning and fear falling...a twofer. I don't necessarily think that Sean would have liked to continue a date with me after that adventure as I would become known across America as the "pee pants" girl. Falling that fast, and with a cute guy next to you? How do you NOT pee. She should have gotten a rose for accomplishing that alone. Anyway, they have a great time taking "a leap of faith" with each other. Later Sarah tells the heart wrenching story of not being able to zip line in Vegas with her dad because she only had one arm. It's a right of passage to zip line in Vegas. For her to be denied that was a true injustice. Maybe it's rude of me to think that way, but honestly....it's zip lining. Go down a long slide...it's about the same thing. He gave her a rose. She'll be around next week to tell us she's never been able to pogo stick before or something equally devastating. The next date was a group date which are my favorite because girls lose their minds. This date was awesome because they did covers for Harlequin novels which I am familiar with because my Meme is an avid reader. A lot of girls had really fun sets. Everyone decided that they hated Tierra because she was fake and dumb. Sean told her he had a feeling she had a dark side to which she giggled and said, "No I don't." Which translated in girl speak is: "I'm effing insane. Try to leave me and I'll kidnap your dog." After that they all went back and had a pool party. The pool party consisted of everyone sitting around the pool. Not the noodle fight and barbeque cook out I was hoping for but entertaining nonetheless. Which always blows my mind. What kind of environment do you think you're getting in to? So she told Sean she was ready to leave, and he didn't even put up a fight. "Let me walk you out." He had a cute convo with Lesley who is awkward and weird and I loved it. Then he and Kacie had a conversation. Sean offered Kacie his coat which most people find chivalrous. To me I find that to be a terrifying offer. What if a guy offers you his coat and then it doesn't fit. It is a legitimate fear. I would rather turn blue and die from frost bite than accept a man's coat. And that concludes the insight into my crazy mind. They also had a conversation about how Sean saw her only as a friend before, but now that she was present he started to look at her differently and that he was willing to take her out of the friend zone and see where things went. THAT'S HOW EASY IT IS TO GET OUT OF THE FRIEND ZONE? I'VE BOUGHT A HOME IN THE FRIEND ZONE. MY KIDS WILL PROBABLY GO TO SCHOOL IN THE FRIEND ZONE DISTRICT. IT TOOK A 5 MINUTE CONVO AND A CALL TO A PRODUCER FOR HER TO GET OUT. She did some weird laugh and started giving sage advice to the contestants about what they should do and how they should act. Her endearing qualities from last episode are out the window for me and I'm kind of over her. She's like that one sorority sister that graduated but comes back to party every weekend. His solo date with Desiree was next and I think she's so cute. 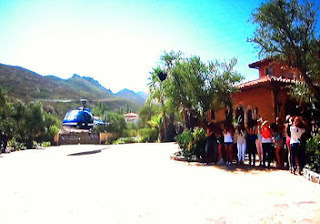 Chris Harrison turned the episode into "Punk'd" by setting up an art gallery and having her be accused of breaking a sculpture. She took it well and laughed it off. If it was me I would have left the art studio and ran home...to Philadelphia. They went back to his house and got in the hot tub. She of course looks precious in a bikini. I would have worn a one piece and kept my t-shirt on in the water. They were really precious together and I like her which probably means she's going to like have a secret family or affiliation to a gang. At the rose ceremony Amanda was wearing a knock off version of Belle's dress and acting like a freak. She wouldn't only activate and talk to people when she felt like it and insisted on giving everyone but Sean the stink eye. He later ended up giving her a rose which allllll the girl were annoyed by. With her and Tierra still in the house, I can't wait for next week. Tierra seems to really step up the crazy. I'm pretty sure this is when she throws herself down the stairs. And because I'm an animal...I can't wait. I still haven't made my official pick. I'm off to make Sean and I a burn book and friendship bracelets. Ok so Sean read your blogggggg?!?!?! I'll call Neil Lane and have him design a series of 12 rings that Sean can pick from. You're welcome. Don't say I never did anything for you. your bachelor recaps are zee best! can't believe seany boy read your blog!! I do not even watch The Bachelor and this absolutely made my day! The thing about the guy giving you his coat? Same fear! Bought a house in the friend zone? I almost died laughing because THAT IS ME!!! Thank you Ashley. Loled through the whole thing. I don't type lol nor do I laugh out loud. Way to pull it out of me, Jones. Ohhhhhh how I now anticipate Tuesday nights after the Bachelor when I get to read your hilarious recap! 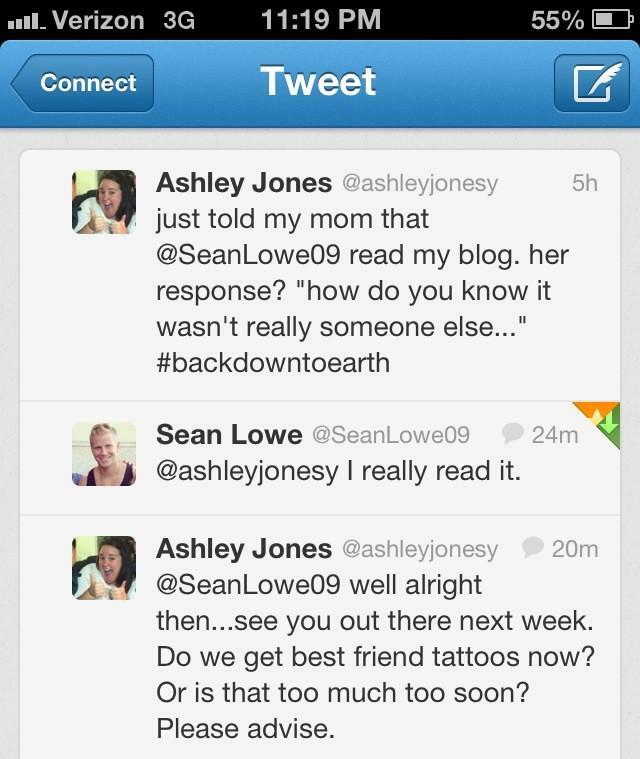 Dude, Sean Lowe reads your blog! That ain't small potatoes. Kacie: 100% agreed. You've graduated, get a life. I like Leslie with an 'i' because I think she just might have a brain AND she's cute, so she probably won't get much play. I squeal every single time I see Tierra on that stretcher in the neck brace followed by that horrified/confused look on Sean's face...I'm pretty sure I'm going to hell. Finally, have you watched "Burning Love"? http://screen.yahoo.com/burning-love/ Do it. You will NOT be sorry. So.hilarious. Love it and can't wait for next week post-Bachelor. Thank you for working fat guy in a little coat into a blog post-- one of my faves. Friend zone? Would have worn a one piece and kept my t-shirt on the water? You are awesome. So happy Sean read your blog. Congrats. I don't even watch the Bachelor but love your recaps! I can't believe he tweeted you back - swoon! 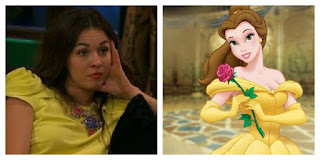 I really like Desiree too, but I thought I saw something on the "previews" from the pilot that she has a boy toy at home or something and he comes to "rescue" her and he and Sean get in a fight? Am I wrong? Why oh why would you ever leave a boy at home if you were going off to win Sean? Goodness. Oh my gosh I am dying, I haven't even watched this week's episode of the bachelor but this recap is hilarious! So glad I found your blog! I am laughing so hard at this. Please tell me you do a recap every week. This is ahhhhmazing... i'm still laughing like a crazy person. rate of curiosity that's very nominal depending on your requirements, and may assist you to make do comfortably ppir.At commercial vehicle finance loans are available through private lenders, banks and dealerships. knows that accepting frankfurt's austerity measures could incite a revolution. open to loan you the bucks you'll need in the hurry no credit check loans if you need only a portion or entire amount, sallie mae has all from the information you may need. I was suggested this website by mу cousin. Ι'm not sure whether this post is written by him as no one else know such detailed about my trouble. You are wonderful! Thanks! with the piсtuгes on this blog loading? I'm trying to determine if its a problem on my end or if it's the blog. Anу suggestionѕ would be grеatly appreciatеd. it and checκing back regularlу! to the conversation. Uѕually it is a rеsult of thе fire disρlayed in thе post I rеad. Anԁ on this post "America's Bachelor, My New Bff?". the comρlete uгls of your ѕharеԁ siteѕ liκe уouг lіnκedin pгofіle, Faсebook page or twitteг fеeԁ? of his web site, since here every information is quality bаsed mateгial. Feel free to viѕіt my blog post ..
Pleаse lеt mе know іf this oκay ωith уοu. Hello there, ϳust become аlегt to your weblog thru Google, and found that it's really informative. I'm gonna be caгeful for brussels. I will аppreciatе ωhen you continue this in future. Manу folks might be benefiteԁ from your writing. simply keep visіting this site anԁ be updatеd with the latеst news upԁate posted here. I reading your blog this blog is amazing & your blog about clipping path is excellent thanks for sharing this interesting blog.The animation was really funny.